It’s been just over two weeks since the last #MedicalBlitz submission received a response from the Medical Romance team and we’re still buzzing about all the exciting worlds we were transported to, the gorgeous docs we met and the electric chemistry we saw between your heroes and heroines! The #MedicalBlitz saw everything from vets to flying docs to surgeons and specialists. We also found ourselves wrapped up in key themes like marriages of convenience, pregnancy, forbidden romance and lovers reunited—all with each author’s individual stamp on them—which was fantastic! Having sent out requests to see more of quite a few projects we’re now eagerly awaiting the chance to see more of the projects that grabbed us and wouldn’t let go and in the meantime we wanted to take the opportunity to send a sincere THANK YOU to everyone who found the courage to hit ‘send’. YOU are what made the 2016 #MedicalBlitz fast track such a success! Almost 40% of authors who participated were submitting to Harlequin for the first time ever. Everyone who submitted to the #MedicalBlitz received individual feedback but there were a few more general tips we wanted to share that we thought you might find useful with your next submission or maybe even the next fast track! Target Your Submission: To give your story the best chance at publication it’s important you ensure it ends up in the right editor’s hand. So, make sure you’re reading the guidelines as carefully as possible and that the line you’re submitting to is the right line for your story. Make Your Submission Stand Out From the Crowd: Remember that your covering letter is your official introduction to the editor—it’s crucial that you put your best foot forward! If everything goes well this could be the start of a very long relationship so win the editor over with a polite, professional, enthusiastic letter and make them desperate to work with you! Make Your Synopsis as Clear as Possible: When an editor is only seeing a portion of your story the synopsis is the road map that tells them where things are going from that point on and how it’s all going to end. Make sure you show us the characters, the hooks, and the twists in store! Start with a Bang: When you have just one chapter to grab the editor make sure they’re gripped from the start so they’re enticed to keep reading. It is crucial that your hero and heroine meet and interact in these first few pages so we can get a feel for their chemistry and that back story and exposition are kept in check. Make Sure Your Hero/Heroine are Utter Professionals: Readers need to be able to trust and respect your characters and their choices so watch for (and try to eliminate!) behaviour that could make them appear unethical, unprofessional or incompetent in their position. Thank you again to everyone who submitted to #Medical Blitz! 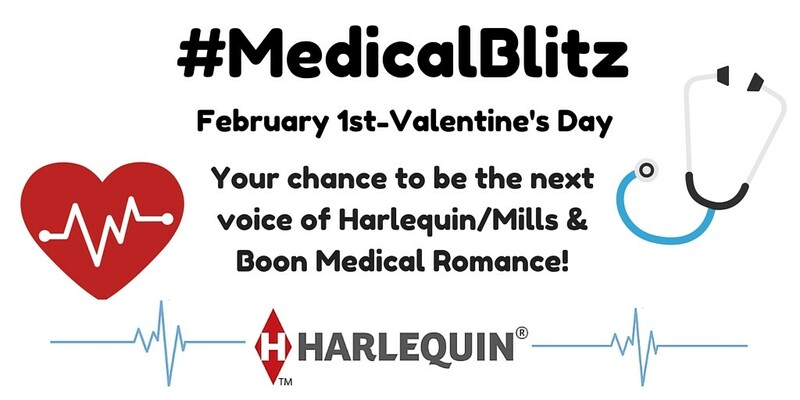 We’re looking forward to working with you on further material and, of course, our hope is that some of you will become Medical Romance authors! And if you didn’t get a request for further material this time please don’t despair. Remember that determination, persistence, and taking and applying learnings from feedback is key to becoming an author. So do try again, we take submissions all year round here: https://harlequin.submittable.com/submit/29558 where you can also find our detailed submission guidelines. The Final Countdown: the last week of #MedicalBlitz!